Frank A. Fisher, 82, Topeka, passed away at Midland Hospice House on November 25, 2018. Frank was born May 8, 1936 to parents Floyd & Bertha Fisher, Wakarusa, KS. 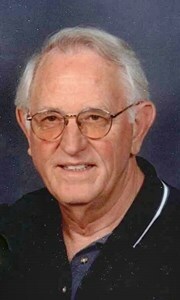 He graduated from Washburn Rural High School in 1954 and from Washburn University with a BA in Business. He served in the Kansas Army National Guard for 9 years. Frank started his career in insurance, working for State Farm and Trinity Insurance; before starting his own independent claims adjusting company, Eastern Kansas Claims Service. He served as President of the Topeka Claims Association & Kansas Claims Association, along with other boards in Topeka. Frank married Diana Day on October 22, 1955. He was preceded in death by both parents. He is survived by his wife, Diana of 63 years; children, Steve (Liz) Fisher, Cindy (Bill) Zimmerman, Susan Fisher, Tim (Pam) Fisher, all of Topeka; grandchildren Craig (David) Ruiz Fisher, Ashley (Chad) Christiansen, Alyssa Harvey; and great grandchildren, Peyton, Paxton & Paisley. In lieu of flowers, Memorial contributions may be made to the Wakarusa Presbyterian Church Fisher Scholarship Fund, which was started in memory of Floyd and Bertha Fisher; or the Helping Hands Humane Society. Add your memories to the guest book of Frank Fisher. I am very sorry for you loss. I remember going to the races with Frank and Steve in Kansas City for many years. Frank loved Dale Earnhardt and always cheered him on! I always had my young kids with me and Frank treated them like family. He will be greatly missed! I am so very sorry to learn of your fathers passing. I've been wondering how he was doing and if we might run into one another again at the hospital. I will pray for you and yours and keep you close in my thoughts during this difficult time. May peace be with you all and may your memories be many. I was deeply saddened to learn of the death of Frank. I knew him for many years as we were both involved in insurance adjusting. My heart felt sympathy goes out to his entire family. May God give you peace at this most difficult time. What a good man and one of the best claims men I have known. We never worried about a loss when Frank was handling it. And I guess we served together in the Kansas Army Guard back in the late Stone Age. I hadn't seen Frank for some years and for that I am sorry. Another reminder to stay in touch with old friends as they are hard to replace. God Bless Friends and Family. Larry B. To Frank Fisher's Family. I am one of your Oregon cousins. My memories of you father are so vast! He was special to my father, your great-uncle Paul Fisher. They joked about sharing the 'famous' Fisher ears and how they marked the "true Fishers". I believe all the men had that characteristic from what I can remember. My parents were thrilled when your parents came to visit them/us in Oregon. So many good conversations and for me it made everyone in the family more real. We didn't often have visitors from the family due to cost. We went to Kansas every other year thru my childhood and had reunions usually held at Dorothy's home across the street from Grandma Fishers in Carbondale. My husband and I were able to visit your parents in 2003 and enjoyed their great hospitality. When we got the Red Robin family letters for years that was the way they kept in touch over the years. I believe the order was Floyd/Bertha, Perry/Mina, in absence of Duke who passed away early in life, his daughter Sandra took that responsibility, Lee/Marjorie, Paul/Leila then Dorothy. Upon death of your grandparents, your dad and mom took over the 'chore". This was how the legacy of the family continued: news of each sibling and family and great photos. So sorry to of his unfortunate fall and resulting death. My heart goes out to you all! May God bless and comfort you during the time ahead. I am very sorry to learn about the passing of your father. You and your family will be in my thoughts and prayers. If there is anything I can do for you please do not hesitate to reach out. Hold tight to the memories they will get you through. It was my pleasure chatting with Frank (and you Diana) over several years at First Christian Church Topeka. We handed out bulletins and greeted the public at the front door many times over the years. I will always have fond memories of Frank and remember him as I knew him. Cindy, Bill and the rest of the Fisher family, you have our deepest sympathies. May God hold you close in times of sorrow. I'm so glad I have the memory of him at your wedding. He was adorable in the receiving line. He just beamed with pride.